On hand for the historic opening of the Cuban embassy in Washington today was Catholic New Service correspondent Rhina Guidos. For the first time since Dwight D. Eisenhower was president, the Cuban flag today flew over its embassy in the capital of the United States. In 1961, the United States and the island nation severed diplomatic relations and embassies in each country closed. Relations had been on the decline since the 1959 Cuban revolution. Revolutionary leader Fidel Castro began siding with Communist nations. After a series of events, including the confiscation of American properties, the rift deepened. Neither country trusted the other. Though neighbors, the two nations remained diplomatically estranged for more than five decades until late last year.That’s when leaders from both countries announced that, after negotiations involving the Vatican, they were ready to work toward normalizing relations. The 10:30 a.m. ceremony in Washington saw protestors, most of them against the U.S. embargo. Some onlookers chanted “Cuba sin Castro,” or “Cuba without Castro” and pointed out human rights violations on the island. Others chanted support for the Castro brothers and yet others were there to protest the embargo. 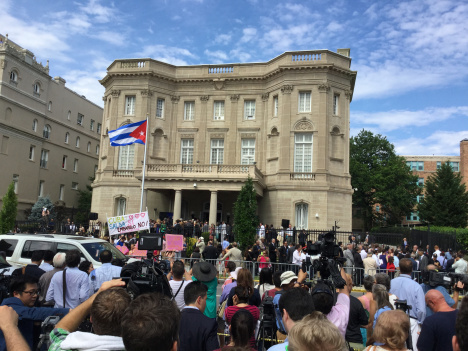 When some in the crowd began chanting “Cuba sí bloqueo no,” or “Cuba yes, embargo no,” officials on the grounds of the embassy clapped. The Cuban Catholic bishops in a June statement said the “new possibilities of dialogue taking place” between the governments of the U.S. and Cuba have brought “an air of hope” to the island. For its part the United States did upgrade its "interest section" in Havana to embassy status but has not yet scheduled an official ceremony noting the change. A State Department official did say this morning that Secretary of State John Kerry planned to attend a Havana flag-raising ceremony himself, explaining, "His presence there is ceremonial. It’s important, it’s historic, but legally the embassy will be functioning on Monday, July 20th. There is not a legal requirement to fly a flag, and we wanted the Secretary to be there to oversee these important events." In his first official visit to Washington Cuban Foreign Minister Bruno Rodriguez presided over the flag-raising ceremony this morning. The Cuban flag was also hung in the lobby ofd the State Department, according to official protocol, according to a State Department official, "a routine installation with no public or media component." Cuban Foreign Minister Rodriguez met today with Secretary Kerry, at the secretary's invitation, and U.S. and Cuban diplomats in Washington and Havana had also noted the upgrade in diplomatic relations via social media posts. The improved relations between the United States and Cuba were achieved partially as the result of diplomatic interventions by the Holy See, which has welcomed the restoration of ties and encouraged more progress. The U.S. Conference of Catholic Bishops has long supported reversing policy on Cuba and has been among the church's supporters of renewed ties, urging Congress not to seek ways to unravels President Obama's diplomatic breakthroughs. In June Las Cruces, N.M., Bishop Oscar Cantú, Chair of the U.S.C.C.B. Committee on International Justice and Peace, wrote: "Our Conference has long spoken out against the negative effects of the U.S. trade and travel embargo of Cuba. We hold that the way to encourage religious freedom and human rights in Cuba is through dialogue and reconciliation between the United States and Cuba, and within Cuban society. To accomplish this, the trade and travel embargo must be lifted. ... We continue to urge Congress to take no action to impair the new regulations on travel and trade concerning Cuba, as recently issued by the U.S. Department of the Treasury. Rather, what is needed is legislation to eliminate the vestiges of outmoded and failed policies of isolation."